Hello crafty friends! Today, we'll show you a few creative ways for using nested dies that results in multiple cards at once. Nested dies are perfect for this technique as they offer different sizes of the same shape. With endless possibilities of die cutting these days you can find nested dies in a variety of shapes, styles and sizes. Though this technique took a lot of time, we truly enjoyed making these bold and vibrant color cards. 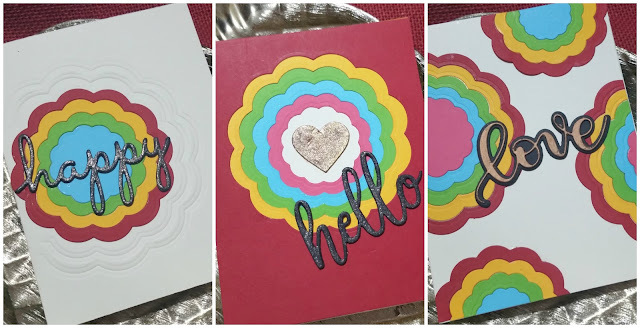 For today's technique, we started by cutting five different colors of cardstock using the scalloped circle nested die set. We cut the topmost layer with the largest die, then cut the next layer with die that was one size down and repeated the process for the rest of the layers.Thus, we ended up with five rectangle pieces with windows and lots of individual scalloped circles in varying sizes. 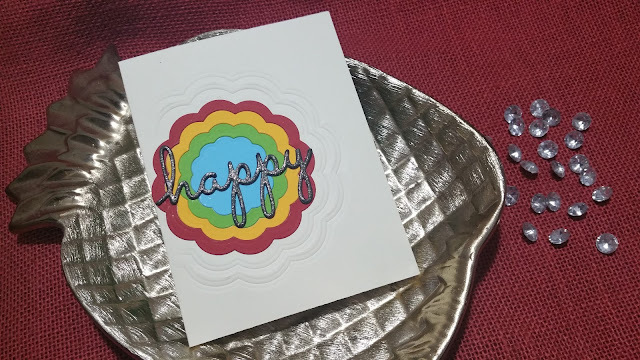 We created our first card with the left over pieces of scalloped circles and used the bigger dies to emboss and make an impression on the card front. Next we cut several pieces of cardstock with 'happy' word die and glued them together to create a chipboard accent. Finally, we added clear shimmer on the sentiment to give a bit of sparkle to the project! For the second card, we layered and glued all five rectangle pieces with windows in a way that the piece with largest window ends up at the top while the piece with the smallest window ends up at the bottom. The end result was a card front with a perfect stair-stepped effect. We cut a small heart from the nesting heart die set and covered it with gold glitter. 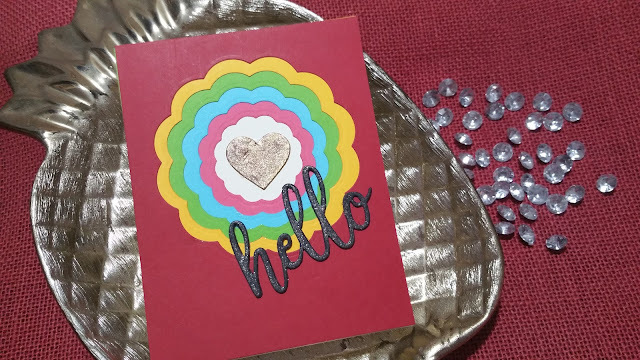 Finally, we cut the word 'hello' from several pieces of cardstock, glued each layer together and added clear shimmer on the chipboard accent. For this final card, we layered all the left over die cuts to create this flamboyant background. Then we used the 'love' die set to cut several layers of the shadow as well as the outline to create dimensional sentiment. 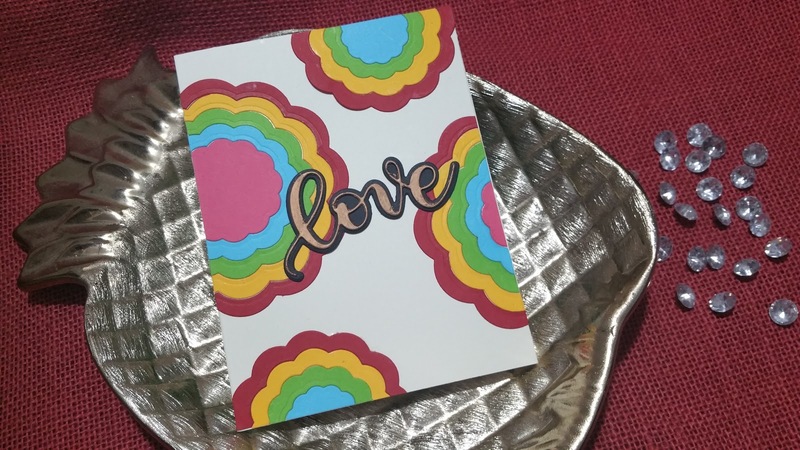 Finally, we used a copper sharpie marker to coat the topmost outline of the word 'love'. Simply amazing, isn't it!